Zeki Aktürk hands out books from the back of his car to children in a village of Kütahya on Jan. 24, 2019. Librarian Zeki Aktürk did not give up books after his retirement and took up an ambitious project to expand people's access to the world of books. Since 2008, donations he collected have helped in founding libraries in 55 schools across Turkey and Aktürk plans to reach out to more bookworms yet. Following in the footsteps of Mustafa Güzelgöz, a librarian who made a name for himself by taking books to villages in the 1940s with bookcases he loaded on the back of his donkey, Aktürk converted his car into a library. 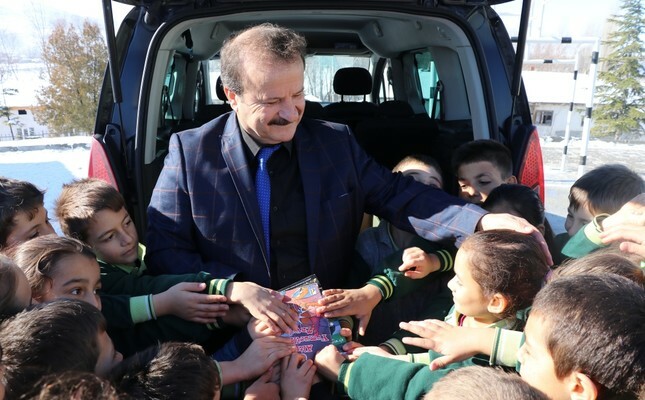 The 57-year-old regularly drives to villages in the western province of Kütahya where he has worked and lived, and delivers free books to children in remote villages. as his. I want more people to read books," said Aktürk, who delivers books to students as they leave school. Aktürk says children "beam with happiness" as they receive the books. "There are children in some places who cannot afford books. I collect books from donors for the libraries. I am proud that children who benefited from those libraries went on to graduate from universities and some among them are teachers," he told Anadolu Agency (AA).